Family meals don't have to be a struggle, thanks to a new resource published by Healthy Child Manitoba. 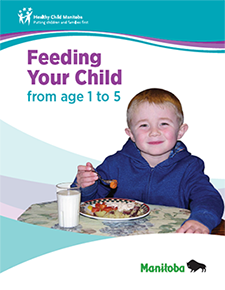 Feeding Your Child from Age 1 to 5 is a comprehensive, easy-to-read guide designed to help take the guesswork out of feeding young children. It is the follow-up to an earlier guide, entitled Feeding Your Baby from Six Months to 1 Year. Both guides are available online and in print. "We do a lot of work with moms, and they always have questions about feeding their children," says Susan Wehrle, a public health nutritionist with the Winnipeg Regional Health Authority. "This guide is intended to provide some answers." Among other things, the guide includes suggestions for healthy meals and snacks, how to involve children in meal planning, how to prevent choking and food contamination, and how to help children enjoy a variety of foods, including vegetables and fruits. Generally speaking, the guide encourages parents to offer children foods and beverages at regular times throughout the day. They should plan for three meals and up to three snacks each day. Younger children have small tummies and need to eat often. But what happens when a parent runs up against a picky eater - a child who won't eat what their parents want them to or doesn't like the food they are being offered? Wehrle often hears complaints from parents about picky eaters, but says it's common for some children to be more cautious with food than others. "Parents can get discouraged by thinking their child is a picky eater, but it can take up to 12 or 14 times of introducing a new food to a child before they become familiar with it and decide to eat it," she says. 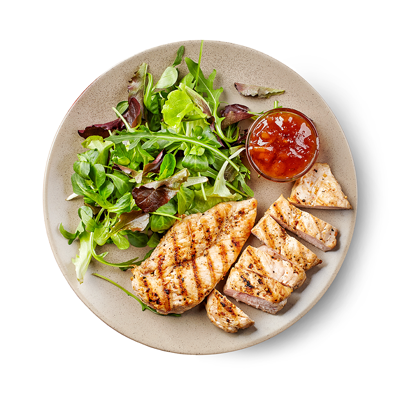 In dealing with children's eating habits, it is important to remember that both parent and child have a role to play when it comes to mealtime. "The parent or caregiver's role is to serve nutritious meals and snacks regularly, but the children get to decide if they're going to eat and how much they're going to eat," says Wehrle. "You have to trust children to make these decisions." 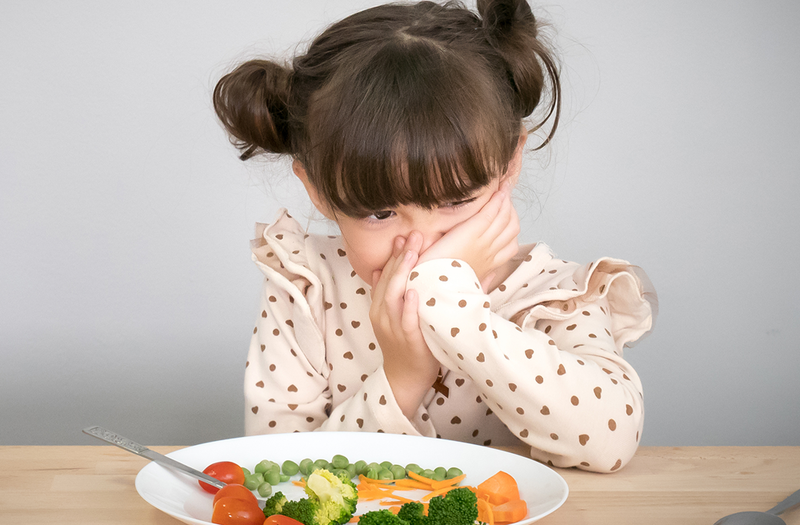 Trusting children to know when and how much to eat can be difficult for parents, who often get nervous or upset when their children refuse food, explains Wehrle. "Parents have a hard time accepting that it's okay to offer food and let a child refuse it. It's difficult to trust the child to eat," she says. "But when we try to control how much a child eats, it becomes a power struggle." Wehrle also advises parents not to become entrenched in the idea that your child is a picky eater. "Eventually, children will internalize that message and believe it about themselves," she says. It's also important to remember that research shows picky eating behaviour will end on its own, as long as parents don't use pressure or bribes, or have too many rules about eating. A common pitfall for parents is making separate meals for the child. "Sometimes we hear about foods labelled as 'kids' foods,' which are often just processed convenience foods. But kids can eat the same food as adults. Good food for adults is good food for kids," says Wehrle. It is also important to remember that "kid's meals" in stores and restaurants are often loaded with salt and sugar, she says. Offering nutritious foods included in Eating Well with Canada's Food Guide and letting children take control of what they eat removes the conflict from meals and makes mealtimes more pleasant. This can require a great deal of patience from parents, but Wehrle says it's worth it. "Children need to learn about their own appetites and how to enjoy good foods through exposure without coercion. It's part of learning to navigate in the world," she explains. "We all need to be empowered to decide when, what, and how much we're going to eat." Wehrle says it is also important to avoid categorizing food. Labelling food as "bad" or "forbidden" can make a child want it more, while calling foods "healthier" or "good for you" won't make them more appealing to children. "It's important to set a good example. Children learn healthy eating habits from watching their role models. They learn to eat healthy foods over time, but if they're at a birthday party, they should be allowed to have cake," Wehrle says. While children are growing and need lots of good nutrition, it's normal for their appetites to fluctuate from day to day and meal to meal. As a result, it is helpful to offer children a smaller amount of food to start at mealtime. They're free to ask for more. As children get older, they need to serve themselves, says Wehrle. "When a child is young, there will be a bit of food waste, but parents will quickly get used to their child's fluctuating appetite." As children grow, they need guidance to build a trusting relationship with food and eating. For children, mealtimes are a way to learn about healthy food choices, table manners, social skills, and family values. "Encourage everyone to share stories about their day," Wehrle says. "Be flexible and adjust schedules to make time to eat and enjoy food together." Studies show that eating meals together is linked to better food choices and improved grades in school. free by calling Dial-a-Dietitian at 204-788-8248 or toll-free at 1-877-830-2892.